If your experience with beef jerky is limited to road trips and convenience store varieties, don’t hold that against today’s Grommet. The spicy, meaty strips of smoke-cured beef we’re featuring are in a whole different league. 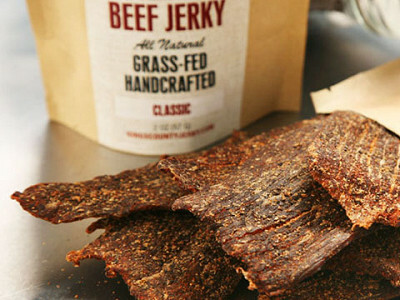 Kings County Jerky Co. uses only pasture-raised, grass-fed beef from local farms in New Jersey and New York, and it seasons the beef with natural ingredients. The Brooklyn company even toasts and grinds its own spices. No artificial flavors or preservatives allowed. The guys behind the company are Chris Woehrle and Robert Stout, two friends who started experimenting with beef jerky, won “crowd favorite” in a regional culinary contest, and later graduated from a balcony smoker to a commercial kitchen as word spread about their delectable strips of spicy, sweet and savory beef. I tried (devoured) all three flavors -- the peppery Classic, spicy-sweet Korean BBQ and tangy Orange-Ginger. They’re phenomenal. Put it this way: If the over-processed jerky from convenience stores belongs with, say, a Mountain Dew, then this artisanal jerky deserves a craft micro brew. Just as your tastes have grown up, so has beef jerky. Kings County is a royal treat. Hey there, Grommeteers! It’s Chris from Kings County Jerky Co.
I’m taking a break from the kitchen to introduce myself and say hi. Let me start by saying we’re really proud of our jerky, and can’t wait to tell you about it! We’re jerky fanatics who became jerky makers for one reason: we wanted to eat the best beef jerky on the planet! Since we couldn’t find it, we decided to make it ourselves. We start with only the leanest cuts of grass-fed beef from local farms. We hand-slice the meat, and make our marinades fresh daily. Our ingredients are 100% all natural – there’s not a drop of corn syrup, MSG or artificial preservatives. In fact, we even toast and grind our own spices! The end result is a snack as guilt-free as it is delicious. We love eating our jerky, and we’re sure you will too. So drop by and say hi - I look forward to talking with you! This looks like a great Grommet - thanks Ann and Chris for bringing this to us! Loved the video and that you personally have vouched for the taste. Just in the nick of time to be a part of my husband's valentine's gift - yum! Looks delicious....tough grommet to present right at the lunch hour! How does the sodium content compare with the classic truck-stop versions of jerky? @Liz B.: The sodium is at least half of what's in the truck-stop stuff. I would like to know the sodium content? Thank you! @Carolyn : We don't have the exact sodium content yet. The FDA doesn't require small start-ups like us to have that information, because of the expensive lab tests it entails. That being said, we realize how important that information is to our customers, and are aiming to have it soon. We will post it on our website as soon as it's available. One thing I do know - the sodium is substantially lower than the big-name brands. Hope that helps! These look absolutely delicious! We featured a cookie maker once who loved to experiment with more sophisticated flavors for cookies. She said to come up with new flavors, you have to be willing to 'throw away a lot of dough'. How long did it take you guys to settle on the flavors you have today and how many different flavors didn't make the cut? @Katherine Klinger: I'd say it took a few weeks to come up with our flavors. We probably went through about a half dozen varieties to get to these three. And we've definitely shed some tears over the beautiful grass-fed beef we're ruined in testing. Because of that, we've eaten a lot of sub-par jerky during the early days as we couldn't bear to just throw it away! Thanks, Kings County! Just placed my order and am very happy to see you're supporting local farmers. You should consider a chimichurri flavor! Or cardamom curry! Or rosemary and red wine! @Julia Elmer: Thanks Julia! And thanks for the flavor inspirations - we've actually got some new ones coming soon, along with a truly delicious Portobello jerky made from meaty strips of spiced Portobello mushrooms. Coming soon! @Chris Woehrle: Even better! I'm the vegetarian in the family... So I'll look forward to the portobello version! @rudy: you should be able to select any three flavors you like - so you should be able to order 3 bags of the REG (CLASSIC) - are you not able to do that on the site? @rudy: Chris is right, you can mix and match between the three flavors for your three pack. If you want all original, you can do that. Is this beef jerkey gluten free? My son has Celiac and loves beef jerky. @Joyce Jacobs: Unfortunately no - the tamari we use contains a bit of gluten. So, how much jerky is included in this three pack? I don't see an ounce/lb. size anywhere! @Eileen: Each bag contains 2 oz / 6 oz total for the three. @Eileen: For the details for any of the products we feature there is a 'Details' tab that you can find just above the product's story (below its video). Is this jerky a dry, almost snap it in half kind of jerky? I love it very dry; so many times the pieces are overly thick and a bit greasy. @Elaine: Definitely NOT greasy. Our jerky tends to be on the drier side. I have the same preference as you, and I am certain you will like it! @Chris Woehrle: Thank you! This is exactly what I am looking for. Received my order today and I will tell EVERYONE that this is the best beef jerky I have ever had! The texture is exactly what I expect in a really great jerky. Thank you for doing this right. @Elaine: Thank you for stopping back to let us know that this jerky lived up to your expectations. We are delighted to hear that! @Elaine: Thanks so much for the positive feedback! We really appreciate you letting us know you liked it! I have to say I was VERY disappointed in the purchase. I love beef jerkey and the flavors of these are good BUT the jerkey was so dry and stiff I could barely chew it let alone swallow it! It was worse than leather and cardboard combined. After spending $33 on it I expected way more from this product. I will not purchase this again and encourage you all to save your money. I was so looking forward to it and was really upset I wasted so much money!! @alyssa: We're sorry to hear that you were disappointed with your purchase. I contacted Chris to determine whether you received a bad batch or whether it was a personal jerky preference. He believes it was a personal preference, that many commercial jerkeys are made with preservatives that keep them unnaturally soft. Of the thousands of bags that they've sold, yours is the first they've heard of anyone not loving their jerkey. I know what it's like to look forward to something that doesn't turn out to be as you hoped, and wish that this purchase had worked out differently for you. are there nitrites in this jerky? @sally di: Great question. Kings County Jerky contains NO nitrites, nitrates, or preservatives of any kind. Also no corn syrup, MSG, or liquid smoke. It contains only grass-fed beef and 100% natural spices. If your experience with beef jerky is limited to road trips and convenience store varieties, don’t hold that against today’s Grommet. The spicy, meaty strips of smoke-cured beef we’re featuring are in a whole different league. 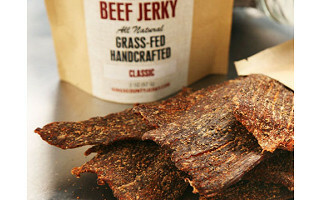 Kings County Jerky Co. uses only pasture-raised, grass-fed beef from local farms in New Jersey and New York, and it seasons the beef with natural ingredients. The Brooklyn company even toasts and grinds its own spices. No artificial flavors or preservatives allowed. The guys behind the company are Chris Woehrle and Robert Stout, two friends who started experimenting with beef jerky, won “crowd favorite” in a regional culinary contest, and later graduated from a balcony smoker to a commercial kitchen as word spread about their delectable strips of spicy, sweet and savory beef.